Oftentimes these days the world can feel like a hopeless place, but the incredible employees of Miller-Sedgwick Auto Insurance in Ann Arbor, Michigan, are living proof that there’s still light and happiness to be found in these dark times. Every day at 5 p.m., everyone in the Miller-Sedwick offices begins to cheer and hug each other because that’s when they all get to go home and have diarrhea. 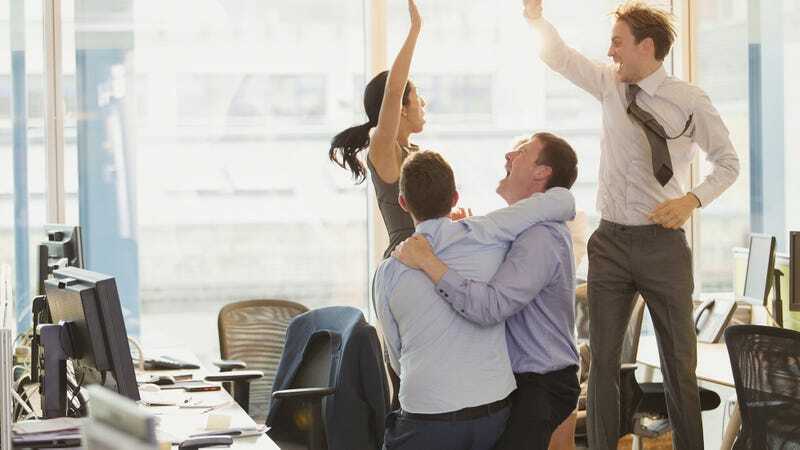 The scene at the Miller-Sedgwick office each and every day at the stroke of 5 is one of pure ecstasy, and that’s because the employees know that the time for going home and having diarrhea has officially arrived. Everyone immediately stops working and celebrates with reckless abandon, giddy with thoughts of the diarrhea they’ll soon be having in their homes as the twilight Michigan breeze flits gently through their bathroom windows like an old friend—an old friend who wants to watch them have diarrhea. Workers in the office can often be heard shouting joyous proclamations such as, “I can’t wait to drive home and have diarrhea at last!” and “I’m going to drive my car to my house at 150 mph, even though I might get killed or arrested driving at such dangerous speeds, because I simply cannot wait to arrive home and have the kind of loose, powerful bowel movement that really means something!” When such sentiments are expressed, the whole office cheers even louder, their hearts fluttering with bliss as they think of the private, loud diarrhea that they’ll soon be having in their bathrooms. It is a lovely sight to behold! Wow, if only all bosses were so kind to their employees! The prospect of getting to go home and have diarrhea truly brings out the best of everyone in this office, and it is beyond inspiring. So the next time you’re feeling depressed over all the awful things in the news, just remember the employees of Miller-Sedgwich Auto Insurance, who every single day are joined together in love and harmony by the beautiful and immutable fact that they’re all about to go home to their bathrooms and have immense, unforgettable diarrhea. It’s a remarkable story that proves that, despite everything, there is still plenty of wonder and goodness in this world.